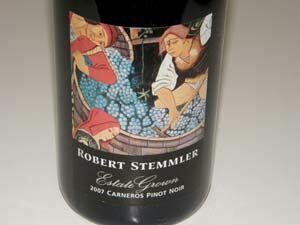 The Robert Stemmler Pinot Noirs reviewed below are newly released. The winegrower is Anne Moller-Racke of The Donum Estate and the winemaker is Kenneth Juhasz. These are solid, well-crafted Pinot Noirs you can put on the dinner table and be proud of. 14.4% alc., pH 3.70, 3,500 cases, $36. 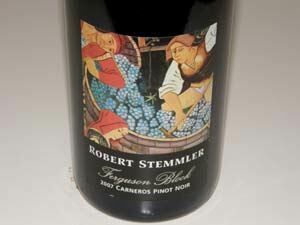 The label is inspired by Le Vendange, a 14th century tapestry displayed in the Cluny Museum in France. Represents every part of the Donum Ranch including Dijon, Martini, Roederer, Calera, Hanzell and Swan selections planted in 1989-1990. 100% de-stemmed, native fermentation and Burgundian yeast isolate inoculation. Aged in 40% new French oak. Lovely aromas of red fruits, lemon cola, cherry cobbler and mint. · Primarily red-fruited with a note of chocolate-filled brioche. On the light side with a good spark of acidity on the short finish. Good. 14.4% alc., pH 3.65, 1,100 cases, $40. 11-acre tightly spaced vineyard planted in 1997 to Dijon clones 115 and 667. 100% de-stemmed. Aged 11 months in 45% new French oak. · The nose is filled with very ripe cherry fruits complimented by Provencal herbs and oak. The black cherry and plum core falls just short of overripeness. A hint of oak, tea and fig adds interest. Nicely crafted and silky textured with a satisfying finish. Good. 14.4% alc., pH 3.52, $44. From the oldest portion of the Donum Estate planted in 1974 to Martini selection on St. George rootstock. Yields are one tone per acre. 100% de-stemmed, native fermentation and Burgundian yeast isolate inoculation. Aged 11 months in 35% new, tight-grain French oak. · Distinctive aromas of cassis, rose petals, green bean, tar and compost bin. Rustic and earthy with a heart of black currants and creme de cassis. Silky smooth with balancing tannins and bright acidity on the finish. Takes on more charm with time in the glass but remains a man’s wine. Good.